joint operation by police in Spain and Portugal has broken up an international organisation which sold Portuguese driving licences obtained with fake documents, selling each for an average of 1,500 €. Their main clients were eastern Europeans who, the Interior Ministry said, often bought HGV licences in this way and then went on to obtain their licence to transport goods.It’s understood the network made weekly trips from their Torrevieja base to Portugal to apply for the driving licences, and is believed to have earned income of of up to 300,000 €.The network also obtained Portuguese residence permits for their clients through marriages of convenience, charging up to 5,000 € for this service. The marriage certificates were used, along with false employment contracts, in order to obtain legal residency in Portugal. British driver on trial in Alicante for the death of a teenage moped rider has been sentenced to 13 years in prison in a ruling which, EFE reports, notes that David Walter Cook continued driving knowing that the youngster was trapped beneath his car. 17 year old José Antonio Caro Buendía from Alfaz del Pi died in March 2008 after he was thrown from his moped by a first vehicle, and was then hit by another which dragged him along the road for 2kms before fleeing the scene. The second car was traced to Mr Cook and his partner, Angela Green, a British couple resident in Polop. The Alicante provincial court said in the ruling released this Wednesday that Mr Cook, originally from Stourbridge, continued driving with the teenager beneath the vehicle before stopping at an urbanisation to manoeuvre the car back and forth and managing to free the body.Mr Cook was also ordered to pay 300,000 € compensation to the victim’s family, while his partner, Angela Green, was given an 18-month sentence for failing to help the teenager. man wanted by the authorities in Italy has been arrested at a routine traffic control in Murcia, EFE reports. He is accused of belonging to an international drugs organisation, and was wanted on an international warrant for his arrest and extradition back to Italy.The suspect, named as A.I., aged 47, was driving a moped when he was pulled over by officers and was found not to have a driving licence. It was after his arrest for that offence that further checks revealed he was wanted in Italy. 41 year old British man who is wanted on charges of falsification and fraud has been arrested by National Police in Rójales, Alicante.The arrest was made on a European Arrest Order and the man will now be appear in the National Court before being extradited back to France where he faces upto ten years in prison.Named with the initials R.A.B., the order for his arrest was issued by the judicial authorities in France only two days ago. Italian man resident in Elche was undergoing emergency surgery on Sunday after being shot while sitting in a parked car near a beach between Elche and Santa Pola early that morning. The only information on the 38 year old’s condition was a ‘reserved prognosis’, EFE said.EFE said the victim was with his partner in an isolated area of Arenales del Sol, when it appears they were approached by a suspected peeping tom, believed to be the person who fired the shots. The suspect then fled the scene and is now being sought by National Police.A similar case is reported in the same area two years ago. Two of five people arrested by the National Police in Benidorm in an operation against drug trafficking, managed to make their escape dressed as airline pilots, according to the police Commissioner in the town, Alfonso Cid. All five arrested were Spanish and had several previous records for drug trafficking, and one of them for murder.They had been watched by the police since March, originally for the illegal sale and traffic of top of the range vehicles, and the police were waiting for the gang at Barajas airport in Madrid on Monday when they returned from Caracas, allegedly carrying drugs. However two escaped by leaving through the pilots entrance.A search in Benidorm meanwhile found 15 kilos of highly pure cocaine, 77 grams of heroin, and two kilos of hashish. 17,000 € and other items were found in a second search. Spanish police are looking for informers among the foreign community on the Costa del Sol in a new policy which they hope will increase safety in the zone. Police has offered an email address where people are invited to send any pertinent information and which they will be able to understand in eight different languages. The Police also promise complete confidentiality. The campaign is based around the slogan ‘Por una Costa del Sol segura – For a safe Costa del Sol’. 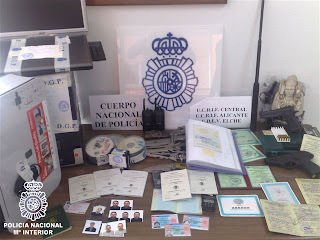 Police are looking for the owners of an electrical appliance shop in Baza, Granada, who are thought to have defrauded more than 600,000 € from more than 50 clients by asking for loans in the clients’ names from a bank using the clients DNI identity cards. They had told the clients that they had to carry out a solvency check before granting credit.Police say they have not ruled out the fraud being even bigger. Autopsy carried out on the body of José Antonio Caro Buendía, the 17 year old from Alfaz del Pi who died last year after being dragged beneath a car for 2 kms, shows that he died from the injuries received while being dragged along the road. The doctors who examined the teenager’s body told the Alicante provincial court on Thursday that the youngster suffered damage to his femoral artery and went into shock from the extreme loss of blood. The experts ruled out that his injuries were sustained when he collided with a first vehicle, before being hit by the car occupied by the British couple who are on trial for his death.They noted injuries to his legs typical, they said, of being dragged.Further evidence was heard from an emergency doctor who attended the scene where the teenager was found dying, who said he was found face up, while the injuries found on his body were evidence that he had been dragged along face down. It would have been impossible, the doctor said, for José Antonio, to have been capable of moving, leading him to believe the teenager was turned over by another person. He added that medical services found a trail of the youngster’s blood along the length of the 2 kms, and pieces of soft tissue some 30 cms from where he was found. The victim would not, he said, have been able to reach the site where he was found by himself.The private prosecution from the victim’s family is requesting a 15 year sentence for the British man who was driving the vehicle, 57 year old David Walter Cook, and 10 years for his wife, 47 year old Angela Maureen Green. The public prosecutor is maintaining its original application for 13 years for Mr Cook, but has now, EFE reports, reduced the sentence requested for Angela Green down to 18 months in prison.The defence argued police failed to present independent evidence, in addition to testimony from their own officers, to prove the accuseds’ part in the youngster’s death.It’s understood that both defence and prosecution have presented their cases, and it’s now up to the court to give its decision on the verdict and sentencing.